A team of experts in mechanics, materials, medicine and tissue engineering have managed to create a self replicating gel which can stretch about 21 times its length. The water-based tough gel is also self-healing and biocompatible, which means it could be perfect for people with cartilage injuries. The new hydrogel (names this way because water is its main ingredient) is a hybrid between two other gels, two rather common polymers, soft on their own, but which become much tougher when put together. For example, one of the polymers, alginate, can only stretch 1.2 times its length before it breaks, but combined in the 8:1 ratio with polyacrylamide (known for its use in soft lenses), boom! They form a complex network of chains that crosslink between them and reinforce one another. The alginate part of the gel consists of polymer chains that form weak ionic bonds with one another, practically trapping calcium ions into the matrix, while the other, polyacrylamide part forms a grid like structure of covalent bonds. As the gel stretches beyond its limit, calcium ions are eliminated, and the gel is ‘unzipped’, as researchers put it; as a result, the gel expands slightly, but the polymers themselves remain intact. Researchers note that even with a huge crack, the hybrid gel can still stretch some 17 times beyond its initial length. But what’s even more important, the hydrogel can maintain its toughness and elasticity after multiple stretches and fractures, and the ionic bonds between the alginate and the calcium can “re-zip”, especially after rising the temperature. “The unusually high stretchability and toughness of this gel, along with recovery, are exciting,” says Suo. 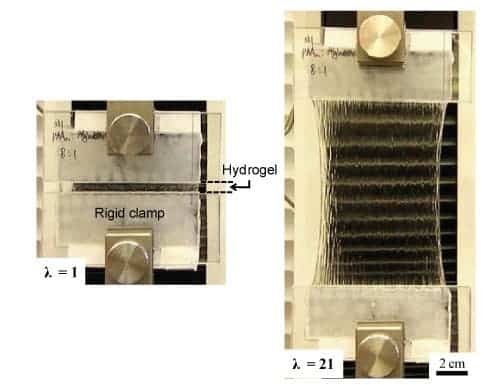 “Now that we’ve demonstrated that this is possible, we can use it as a model system for studying the mechanics of hydrogels further, and explore various applications. It’s very promising,” Suo adds. Beyond being used as a replacement for cartilages, scientists explain it could also play a role in robotics, optics, and even artificial muscle.